I checked in to 4 places, took 1 photo, and wrote 1 microblog. I was in Isla Mujeres, Cancún, Chicago, Des Moines, and El Meco. 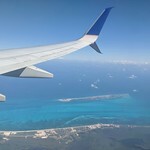 On the way out, our plane flew right over our resort, island we visited, and the spots we snorkeled in between. 10:00 pm Home... I think I'll be fine with not having any fruity drinks for a minute. Though, I am gonna miss the beaches and pools a bit..